Prof. Craig Barker is the Dean of the School of Law and Social Sciences and a Professor of International Law. Appointed in 2015, Prof. Barker was previously Professor of International Law at the Sussex Law School, University of Sussex where he served as Director of Research (2004-8), Director of External Relations (2008-9), and Head of Department (2009-12). He was Director of the Centre for Responsibilities, Rights and the Law from 2012-15. Prof. Barker has taught extensively in the areas of domestic and international law, as well as international politics. He is a leading international expert on issues relating to diplomatic law and diplomatic immunity. As a generalist international lawyer, Prof. Barker has taught and written on a diverse range of topics including immunities from jurisdiction, terrorism, use of force by States, international criminal law and international commercial law. He is a regular contributor to local, national and international media. 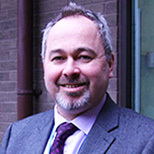 Prof. Barker is a qualified solicitor having completed his training with Dickson Minot WS in 1993. Prof. Barker’s teaching interests include Public International Law, International Criminal Law and International Commercial Law. He has taught at the Universities of Glasgow, Edinburgh, Reading, Oxford and Sussex as well as LSBU. He has also served as Visiting Professor of International Criminal Law at the Open University of Tanzania. Prof. Barker is the author of nine books and numerous journal articles and book chapters. His primary research interest is in the field of public international law. He completed his PhD on the topic of "The Abuse of Diplomatic Privileges and Immunities" in 1991 and has subsequently written on international immunities from jurisdiction in relation to diplomats, states and heads of state. He has also researched the relationship between international law and international relations and as well as aspects of international criminal law. Prof. Barker’s current research is focused on the notion of responsibility in international law, particularly in relation to the so-called “responsibility to protect”. His primary argument is that responsibility, in both domestic and international law, is best understood as a relational concept that depends upon notions of solidarity, humanity and caring. His most recent work in this regard has focused on the conflict in Syria and the developing refugee crisis in Europe. Prof. Barker was a member of the Executive Board of the International Law Association from 2007-2014. He is presently the reviews co-editor of the British Yearbook of International Law and has previously served on the Editorial Board of the International and Comparative Law Quarterly. He has extensive external examining experience, most recently serving as a Chief External Examiner at the University of the West of England.